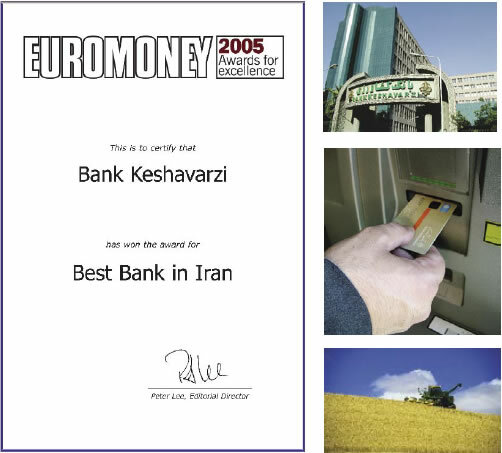 According to the European publication, Euromoney, Bank Keshavarzi Iran has been recognized by this publication as the most outstanding and successful Iranian bank, Iran's superior bank in 2005. Euromoney's report adds that judging by such factors as: share of deposits held by the bank, its share of financial supply market besides credit cards, the number of e-customers and its share of retail customers, the rights of shareholders, profit-making, and some other trade data, the publication identifies the best banks at world, regional, and country levels. According to these surveys it has recognized Bank Keshavarzi as the best bank of Iran in 2005. Furthermore, the publication, The Banker, the banking organ of the Financial Times Institute found Bank Keshavarzi the most outstanding Iranian bank for the second consecutive year. Last year (2004) The Banker carried out surveys in 133 countries identifying the best bank in each, among them Bank Keshavarzi, which was rated as the top bank of Iran. These surveys are based on such indexes as: capital return, return on assets, profit generation, growth in profits, the ratio of expenditures to revenues, ratio of profits to average capital, growth in assets, as well as certain qualitative indexes such as technology development, service quality etc. It is interesting to note that at the same time The Banker has identified Banque Credit Agricole as the best bank in France, Deutsche Bank in Germany, HSBC Bank in Hong Kong, Mitsubishi Bank in Japan, Royal Bank in the UK, and National Bank of Kuwait, in Kuwait.